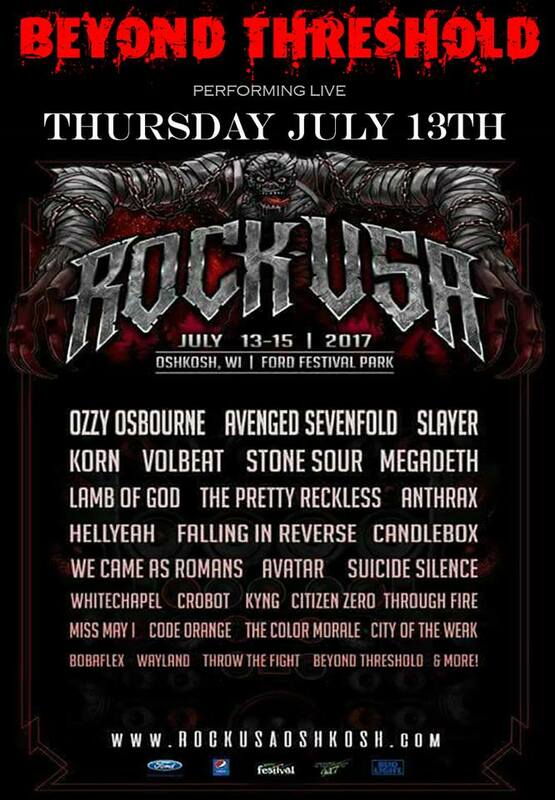 Beyond Threshold at Rock USA 2017 in Oshkosh, Wisconsin on THURSDAY JULY 13TH w/ Ozzy Osbourne, Avenged Sevenfold, Slayer, Korn and many more! BUY “LIVE TO FIGHT” NOW!!! BUY “WHO WE ARE” (DELUXE EDITION) NOW!!! Join the BEYOND THRESHOLD E-mail list!!! Friday October 6th in Ringle, Wisconsin!! WCCN Radio – 107.5 The Rock​ & Ardent Entertainment​ welcomes: Superjoint​ ( Phil Anselmo​ from Pantera​ & Down) & DevilDriver​ wsg: King Parrot, Cane Hill, Child Bite, & Beyond Threshold​ to The Q & Z Expo Center​! Friday September 29th in Ashwaubenon, Wisconsin!! RAZOR 94.7 WZOR welcomes: Starset & Beyond Threshold wsg: Red Light Saints to The Green Bay Distillery!! © 2019 BEYOND THRESHOLD. All Rights Reserved.